Heal Your Leaky Gut and Cure your Allergies - And More! 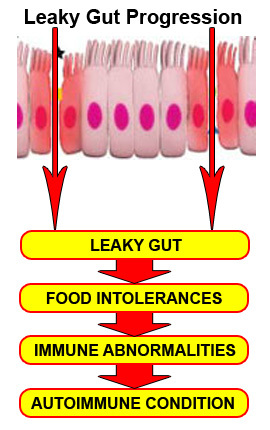 You may have heard of Leaky Gut Syndrome: But what is a Leaky Gut? What happens is many years of poor eating, poor digestion and/or not drinking enough water erodes the lining of the gut. Stagnant wastes sitting around in the large intestine with delayed digestion also create parasite infestations that almost always simultaneously exist when someone has a leaky gut. Gross yes - but wouldn't you rather know? Parasite infestations can cause many problems from digestive ailments to joint pain and they can be eradicated through natural means. In a compromised intestinal lining, food materials traveling through the gut find their way through tiny perforations of the intestinal lining and end up in the blood stream (where they DO NOT belong). The body recognizes them as invaders and launches a response against the invader much the way it would respond to a pollen. The body is pretty smart and it remembers those allergens as proteins that didn't belong in the blood stream. The body then sees any similar protein substance in the system as an invader. A common symptom of leaky gut syndrome is allergies to dairy, wheat, gluten, corn, soy, pollen and so on; All contain proteins. Itching & watering eyes, skin reactions & inflammation or closing of the throat are all immunological responses of the body to protect itself. This is the response the body gives when an allergic reaction event occurs. You see mucous, watery eyes, throat swelling and even closing, skin reactions etc. All of this is your bodies way of mitigating the damage of what it presumes is an invader in the body. Is it easy as that? Everyone is different. You may be allergic to dairy and this provokes your reaction to pollen. While your healing your gut you will find relief from allergies if you avoid dairy, limit wheat and begin juicing on a regular basis (3-5 times a week). I know it works because I do it! I AM working on healing my gut as we speak! Taking L-Glutamine powder found in this amazing product IntestiNEW. Each week I make a potato broth soup. Potatoes with the skins (potassium is in the skins) plus onion, celery, peppers, carrot garlic and herbs and a touch of sea salt. Simmer with the lid on for 4-6 hours on the lowest setting for an amazing nutritious (Potassium Filled) soup! I make plenty extra to throw in canning jars so I can have it warmed up any time I want it. Saves me time & money! Make sure to keep them refrigerated. I'm also juicing daily and I've really been reaping the benefits of this too. Better skin, better energy levels and easier weight maintenance. And Finally I just picked up the MagPhos and Nat Mur I mentioned to help heal the lining of my intestines and dry up my allergies. Bone broths also work amazingly to heal the lining of the intestinal track! Check out this Nourished Kitchen recipe to get started. I no longer follow a recipe and make bone broth regularly during the winter months. It's wonderfully healing, delicious and nutritious. What's the problem with taking the Claritin D or Nasonex for seasonal allergies? How about applying topical steroidal creams for skin issues like eczema or psoriasis? When we suppress these natural reactions of the body, we push the pathology deeper into the body and it causes more problems down the trail. For example; Eczema is a very common childhood and adult hood problem. Application of steroidal creams suppress the outward expression of internal disease. The body is asking for help to be balanced! When we suppress, the body abides and buries the signal that something is wrong deeper into the systems of the body. This is why between 50 & 70% of childhood cases of severe atopic dermatitis go on to develop asthma. The body will simply manifest the disease somewhere else where it can really get your attention. The practice of suppressing illness in this way leads to a life time of chronic illness. It goes from Leaky Gut, to Allergic Responses, then from there the imbalance manifests into an autoimmune condition in which the body literally attacks it's own tissue. You can heal your leaky gut, cure your allergies and more! I'm happy to help you in find what your looking for in natural health!